This entry was posted on May 27, 2010 at 5:53 PM	and is filed under Uncategorized. Tagged: crazed stalker, Joe McGinniss, Random House, Sarah Palin. You can follow any responses to this entry through the RSS 2.0 feed. You can leave a response, or trackback from your own site. Simply an amazing – and heartbreaking – story about Jeffrey MacDonald!! That name didn’t ring a bell, but when I read the circumstances of his trial(s) & tribulations, I recalled from the distance of 30-plus years ago that sensational story of the Army doctor that was accused of those horrible murders. 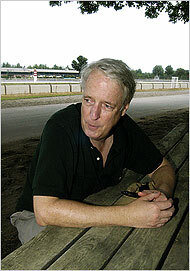 After the initial report and sensational publicity, I lost the thread and simply did not know what had happened to him – AND, more germane to the present situation vis-a-vis Palin, had not remembered at all the saga of McGinnis’ despicable role in all of this or, of course, that infamous book he wrote. Now may be a time to bring justice and a fair resolution to BOTH situations that involve one of this country’s true scumbags: Namely, resurrect this story of MacDonald again and the egregious role played by McGinnis (which earned him a great deal of REAL “blood money!”). When a whole new generation of Palin fans – and even Palin detractors – is reminded of McGinnis’ lies that actually helped keep an innocent man behind bars, perhaps a sense of fairness and justice will expose – for once & all – the nefarious McGinnis (who. in the recent past, has existed in semi- and/or relative obscurity for many years). If there is a God in Heaven, both Palin & MacDonald should live to finally see the destruction of McGinnis and a reputation built on LIES, LIES and more LIES!! With this excellent article just posted, let The TRUTH will out and Good prevail over Evil! Meantime, Todd, get that “security fence” erected and in place ASAP! !